But what is blockchain, exactly…? “Distributed ledgers than create an unchangeable and shared record of transactions”. OK, sounds interesting, but how does it really work? And most importantly, what does it mean for retail? 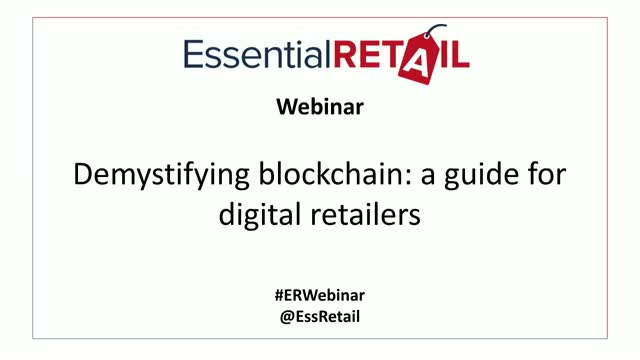 Join this Essential Retail webinar as we demystify blockchain with IBM, retailer and analyst. - Demystifying blockchain – IBM talks us through the buzzword, explaining its an "engine of trust"
But how do we use social media to sell products in 2019? And what are the latest platforms we should be investing time and money into? All that and more will be answer in this webinar. •To influencer or not to influence – are influencers all that? Whether you like it or not, Amazon is here to stay. And while recent changes in tax law may have levelled the playing field, this pureplay giant is still constantly sending shockwaves through the retail industry, with its launched into grocery and fashion, the pharmacy sector is ripe for digitsing and Amazon may be the player to disrupt it. •What are Amazon’s strengths and weaknesses? •Is it just Amazon we should be concerned about? •How can retailers mitigate against eCommerce competition? •What technologies can retailers deploy to ensure their business – both physical and digital – is ready to do battle? Chinese retailers are becoming more demanding than ever. With smartphones becoming an integral part of their daily lives, they use social platforms not just to talk with their friends and families, but the shop and pay for their goods. The Chinese consumer is also developing an appetite for western brands and retailers need to wake up to the fact that should look towards this economic powerhouse if they want to learn how to futureproof their retail operations. •How Chinese retail is changing ? •How advanced are Chinese retail stores? •What’s the big deal about WeChat? •And how can UK retailers capitalise on the Chinese consumer? •What might a store look like in the future and how technology will blend the store and the shopper. Steve Jobs has a lot to answer for. The humble smartphone has provided connectivity, productivity and entertainment beyond our wildest dreams in little over a decade. But the rate at which this device has come into our lives and changed the way we communicate, watch television, shop, bank and work has had a huge impact on businesses all over the word. End users are putting pressure on their IT department like never before, demanding flexibility and a seamless experience on their work laptops, tablets and mobiles. Not to mention that nearly every employee has their own smartphone, so why can’t they use that powerful computer in their pocket to do their job. The seamless experience of using apps like Uber, Spotify and Monzo in everyday life has conditioned end users to want that same experience during their hours of work. But IT needs to have a stable, standardised platform to enable these devices to work within the secure perimeters of business. In this webinar we address the key issues surrounding mobility and productivity and what the office of the future may look like. We also take a look at the changing role of the CIO and how the job used to be about “keeping the lights on”, but now has wider implications for a retailer’s overall digital strategy. • Bring-Your-Own-Device (BYOD) was the hottest buzzword five years ago, but where are we now in terms of employees using their own mobiles to perform tasks within the workplace? • What does the workplace of the future look like? • How can retailers use solutions such as the cloud and virtualisation to make their employees’ lives easier? • How do organisations de-mystify printing in a digital workplace? How can retailers make the simple experience of hitting ‘print’ easy and seamless for their workers? • How has the role of the CIO changed in recent years? •What were the hottest trends of 2018? •What is coming around the corner in 2019 in terms of the latest technology and design trends? •And the answer to the biggest question of the year – is the high street really dying? Is it a terminal disease or can we save our favourite shops? Subscription isn’t new. Consumers have been signing up to their favourite magazines for years to ensure they don’t miss a single copy. But in the early 2000s the idea of signing up to get the latest films on DVD sent to you through the post took off and LoveFilm transformed the way consumers rented films… that is until streaming services took hold and transformed the industry all over again. But several other businesses have taken hold over the last decade – Graze and Birchbox continue to go from strength to strength, proving customer loyalty is intrinsically linked with a great product and excellent service. But what is the opportunity for retailers? In this webinar we will discuss how retailers can capitalise on the subscription economy. Former board member and MD of LoveFilm, Jim Buckle will discuss how he delivered 8x subscriber growth and led the business to a successful exit via a trade sale to Amazon in 2011. Now, COO at Feelunique he will also share his thoughts on how retailers can capitalise on the subscription trend. Join Feelunique, Essential Retail and razor blade subscription company, Cornerstone, to learn all about the subscription opportunity. •Where has the subscription boom come from? •What does a good subscription service look like in 2018? •How can retailers use subscription to their advantage? Hospi the robot offers a quick guide to Panasonic's history during Essential Retail's visit to the company's Osaka HQ, but the technology's wider use is in hospitals and airports, and it has potential for deployment in the retail, hospitality and entertainment industries. In this webinar, we will discuss how retailers can attract and retain talented technology workers in an ever-increasing digital world. Ten years ago, technology and IT were lumped in together as the people who “kept the lights on” in the retail world. Now, as more and more customers digitise their shopping journeys, retailers have woken up to realise exactly how important their technology and IT workers are. But in the meantime, little-known companies like Google, Facebook and Apple have become the career goal for many technologists entering the industry. A little late to the game, retailers must convince this pool of talent that retail is a great place to work. •Where do you find retail technology workers? •How do you compete with the tech giants to convince technologists that retail is a good career path? •How do you retain talent within your organisation? •How can retailers mitigate against Brexit when it comes to accessing the very best talent? Today’s digital-savvy customers expect to be able to buy on their terms - how they want and whenever they want. This is good news for retailers because customers who buy across multiple channels are more loyal and spend more. But in order to win and retain these customers, retailers need to create a seamless and holistic experience at every customer touchpoint, and many are falling short of realising this to its full potential and failing to meet rapidly rising customer expectations. On this webinar, we will discuss how retailers can rise to this challenge by developing a deep understanding of their customers’ needs and expectations across the entire customer journey, break down organisational silos, and deliver seamless and connected journeys that delight customers and drive business growth. The very idea of “luxury” is evolving, and brands must innovate with new models, services and marketing strategies in order to compete with premium and lower-priced retailers that are now filling the values that luxury brands used to exclusively own. Essential Retail tackles chapter ten of The Omnichannel Survival Guide – Think Bigger Than Your Brand. In this video, watch editor, Caroline Baldwin, interview Chris Tanner, founder of Brightpearl, Richard Auden, owner of Lush Longboards, Andrew Busby, CEO of Retail Reflections, and Clifton Vaughan, director of Natural Baby Shower. Essential Retail tackles chapter nine of The Omnichannel Survival Guide – Reporting Analytics & Insights. In this video, watch editor, Caroline Baldwin, interview Chris Tanner, founder of Brightpearl and Lee Adams, founder of Open 24 Seven, as they discuss how retailers can improve their businesses using eCommerce analytics. Essential Retail tackles chapter eight of The Omnichannel Survival Guide – Omnichannel Inventory Management. In this video, watch editor, Caroline Baldwin, interview Chris Tanner, founder of Brightpearl and Lee Adams, founder of Open 24 Seven, as they discuss the inventory challenges facing omnichannel retailers. Essential Retail tackles chapter seven of The Omnichannel Survival Guide – Accounting For Omnichannel Retail. In this video, watch editor, Caroline Baldwin, interview and Chris Tanner, founder of Brightpearl and Lee Adams, founder of Open 24 Seven, as they discuss the challenges SMEs have when digitising accounting. Essential Retail tackles chapter six of The Omnichannel Survival Guide – After The Sale. In this video, watch editor, Caroline Baldwin, interview and Derek O’Carroll, CEO of Brightpearl, Mark Mikkelson, founder of Shiptheory, and Chris Drive, head of marketing at Selwood Products. Essential Retail’s editor, Caroline Baldwin, takes to the floor at RBTE, asking industry experts their opinion on the biggest challenges facing retailers today. Essential Retail’s editor, Caroline Baldwin, chats to the companies which featured at RBTE’s Start-up Safari. She asks what they think retailers are struggling with when it comes to retail technology. Covering breaking UK and international retail news stories from a tech perspective, Essential Retail provides clarity as the digital revolution continues to transform the retail industry and wider business landscape.